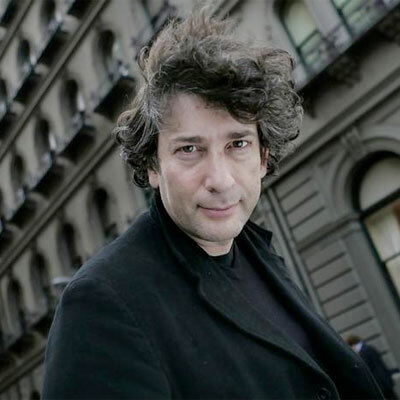 Neil Gaiman's most famous for being the author of The Sandman comic book series, plus novels like Coraline, American Gods and Stardust. Plus he's written a couple of episodes of Doctor Who, one of which airs in a couple of weeks. Last year, he was asked to deliver the commencement address at the University of Arts in Philadelphia. He gave them a hell of a speech about life as an artist. HarperCollins is turning it into a chapbook designed by Chip Kidd — and they've just released an interactive preview, which you can check out online here. "When you start out on a career in the arts, you have no idea what you're doing. This is great. People who know what they're doing know the rules — and they know what is possible and what is impossible. You do not. And you should not. The rules on what is possible and impossible in the arts were made by people who had not tested the bounds of the possible by going beyond them. And you can. If you don't know it's impossible, it's easier to do. And because nobody's done it before, they haven't made up rules to stop anyone doing that particular thing again." "A life in the arts is sometimes like putting messages in bottles on a desert island and hoping that someone will find one of your bottles and open it, and read it, and put something in a bottle that will wash its way back to you." "When things get tough, this is what you should do: make. good. art." "We're in a transitional world right now, if you're in any kind of artistic world... Which is on the one hand intimidating and on the other immensely liberating. The rules, the assumptions, the now-we're-supposed-to's of how you get your work seen — and what you do then — are breaking down. The gatekeepers are leaving their gates... The old rules are crumbling and nobody knows what the new rules are. So make up your own rules."